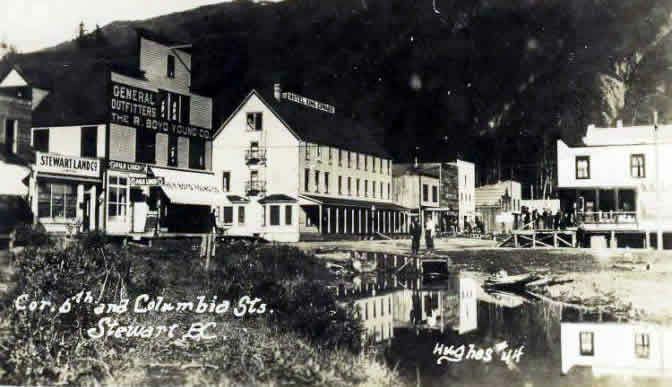 In 1903, M. K. Rodgers, who had successfully opened up the Nickel Plate mine in the Kootenays, and was then developing the copper deposits on Observation Inlet, later the Anoyx mines, paid a visit to the district and after investigating the Mountain Boy claims on American Creek, he endeavored to acquire them, but the large down payment asked prevented a deal being made. Rodgers was impressed with the property and the mineral possibilities of the country generally, and engaged J. Stark, a colored prospector, to prospect and locate vacant ground in the neighborhood of the Mountain Boy, and then to continue prospecting in other parts of the territory. Stark was a good prospector and worked alone. He set out to systematically traverse the area with a view of finding out the trend of the mineralization, and in his travels he covered a large amount of ground and made many locations. His agreement with Rodgers was that all locations made would have a certain amount of development work done on them, and although considerable work was done on some of the claims, others received little attention and Stark claimed that had more work been done, properties of merit might have been opened up. He was probably right in this, as several claims staked were afterwards relocated by others and developed with good results. The only property still retained by the Rodgers interests is the Silver Bow on Glacier Creek. At that time the main obstacle to transportation was the Bear River, which could only be crossed at dangerous fords. Stark strung a cable across the river where the railway now stands and for several years it formed the only means of crossing the river, until the first bridge was built in 1907. The bridge occupied the site of the present one and was built without spans and suffered several washouts before it was replaced by the present structure about ten years ago. With the exception of a trail to and up Bitter Creek, built by the former owners of what is now the Roosevelt property, the district was without roads. The trail was extended to the Mountain Boy in 1903 for which an appropriation of $1,000 was made. This was the first expenditure for the district, and materially assisted the opening up of a large area of mineral territory.